last week i realized that i spend up to 15 hours a day staring at screens. 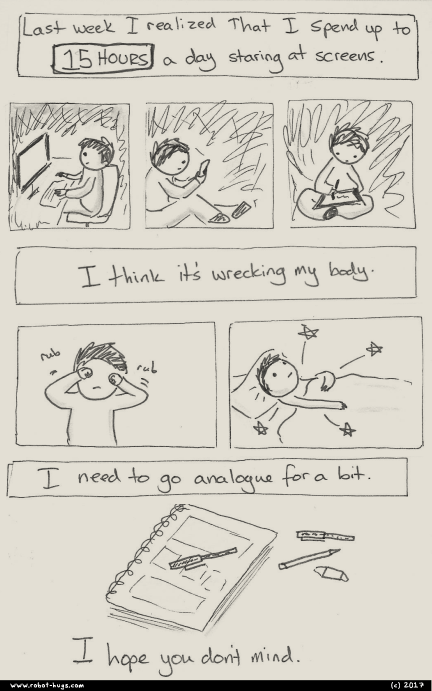 I think it's wrecking my body. I need to go analogue for a bit. Last time I went to the optometrist the doctor asked me how much screentime I have and I was like hmmm usually between 8 and 16 hours a day depending? He seemed pretty unhappy with that answer so I guess isn’t not great. Anyways I think being hunched over desks and drawing tablets is starting to really take its toll – I’m feeling sore and tense and tired all the time. I don’t want to cut back any more on doing the comic, so I’m going to try this ‘ink and paper’ thing I’ve been seeing around, at least for a while. Thanks for your patience.